Thurrock Marching Brass is delighted to announce that Jay Lindner has been appointed by the board as Corps Director for the next three years. Jay comes to us with a varied and rich history in the marching and performing arts, having started his musical career at Tilbury Brass in 1982 where he spent six years developing in to a fine musician. He has also spent time with the Blue Ambassadors, Mayflower Corps and the Black Knights in the UK before heading to the USA to march with the Crossmen and then the Spirit of Atlanta. Jay joined Thurrock Marching Brass in 2014 and as Brass Caption Head has rapidly embraced the TMB way of life and brings with him a fun side that the kids love. An active player with High Voltage Big Band Jay has all the ingredients to take the team forward and onto new heights. After five incredibly rewarding and successful years developing programs to compete on the WinterGuard United Kingdom (WGUK) circuit, bringing together the entire TMB family under one roof and entertaining audiences up and down the country, Thurrock Marching Brass are announcing a new direction for their winter programming and for Thurrock Academy. The winter will now see a full mobile theatre production being written and produced that can showcase, together, all the musical and performing arts talents from both the Corps and the WinterGuard parts of the organisation. This winter theatre can be performed at numerous events across the UK and Europe, as well as in schools and local theatres. 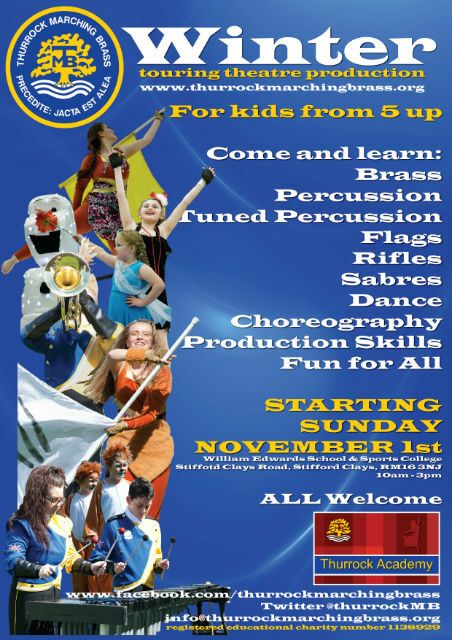 If anyone is interested in being part of the new winter theatre production, please contact us via the Corps Director (details above), or via our website www.thurrockmarchingbrass.org. Production commences at 10am on Sunday 1 November at William Edwards School & Sports College, Stifford Clays Road, Stifford Clays, RM16 3NJ. This change of direction will mean that Thurrock Academy colourguards will not be competing on the WGUK circuit going forwards. Speaking of the new direction, Thurrock Marching Brass Chairman, Paul Morgan comments “Firstly, I would like to extend my congratulations to both Jay and Cheryl on their appointments. Both the band and the new winter programs are in good and capable hands and I very much look forward to how they are developed going forwards. Secondly, for the past 18 months we have been looking at ways we can grow the organisation, specifically the marching band, and have an incredibly strong winterguard program which has made that difficult to achieve as we all but close the band down between October and April save for a few local performances and parades. This has meant that we have missed opportunities to focus on recruitment for the band specifically and because many of our musicians move over to the winterguards to perform, the planned musical development has been slower than hoped. This new direction is geared to address that issue and to provide both our musicians and our performing arts talent the opportunity to combine into a single winter theatre production that we can then showcase in many areas, including schools and other circuits across the UK and Europe. The idea for us is to develop the winter theatre production in such a way that many of the learned components will in effect be reusable for the summer production, giving all those involved an immediate head start for that phase of our yearly planning. The production we choose for the winter theatre will be the same production that we will take to the competitive field with some modified music and visual elements to generate an outdoor visual production for it. I am not sure if this has ever been done before, but this will mean that we will have a full musical program throughout the winter as well as a full performing arts colourguard program that existing and new members can get involved with. Before we have only started the summer musical programming in April and after the Winterguard season has concluded. We have lost youngsters who have come along during the winter time who are not interested in colourguard, which has been extremely frustrating given our focus during this time is on that element predominantly. This strategic shift in focus is to try something new to address and support our growth going forwards. We will remain a young organisation and look forwards to attracting more into our ranks over the coming months to boost both the band and the colourguard, so putting these two elements and skills together makes perfect sense to us. Adding to that the excitement of a theatrical production that can be mobilised in many places then the possible performance experiences increase hugely for our members and allow us to showcase what we do to a wide and more importantly, newer audience base. By attempting this, we hope to create a sustainable pattern of program writing that will create a reusable and successful model for others to try out and even develop further. Time will tell whether we will be successful but we are very excited by this shift in direction and can’t wait to get started on it. October planning is underway ready for a 1 November 2015 start and this all sets the stage for an exciting 2016 season. I for one can’t wait”. Adding, Thurrock Marching Brass’ new Corps Director, Jay Lindner says “I am honoured and proud to have been accepted by the board of Thurrock Marching Brass as the new Corps Director. I am more than familiar with its rich history and even more so the brand names of Thurrock Marching Brass and Thurrock Academy; both of whom mean so much to a great many people. I will protect that and respect that at all times. The opportunity to develop something new and exciting for our members is within our grasp, and to be able to do so in an environment like we have at TMB gives me great confidence that we can really create something for everyone to enjoy. Doing this also means that I can look at more formal accreditations for both our young musicians and our performing arts talent and give them the widely accepted accreditations in Music Theory and Dance that will help them outside of TMB too. Our, and my aim is to ensure that we always have an environment where learning is fun. By creating that, young people develop so much faster and so I am going to rely on the incredible talents of my own staff, but also look at bringing in theatre, music and dance industry professionals to teach us how to work in this new space for us. As these relationships are solidified we will announce their collaborations but the initial discussions have been extremely positive. This is a place of vision for youngsters and I hope to play my part in ensuring that our vision to develop young talent into confident and socially acceptable individuals with good solid values continues during my leadership term. I would like to thank the board for this opportunity and very much look forward to setting and achieving new and exciting goals in the coming weeks, months and years”. Posted by News Editor on Thursday, October 1st, 2015. Filed under Drum Corps U.K., FrontPage Feature.